Spring Greening: 10 Simple Tips! Spring is just around the corner (March 20th 2013 to be exact!) and spring is the perfect time to make a few changes in your life to clean-up your home, the planet and most importantly, green up your lifestyle. So along with cleaning out the garage, milling through outdated clothes in your closet and scrubbing the veggie drawers in your fridge, take a few steps to embrace all things GREEN via recipes, habits and activities. 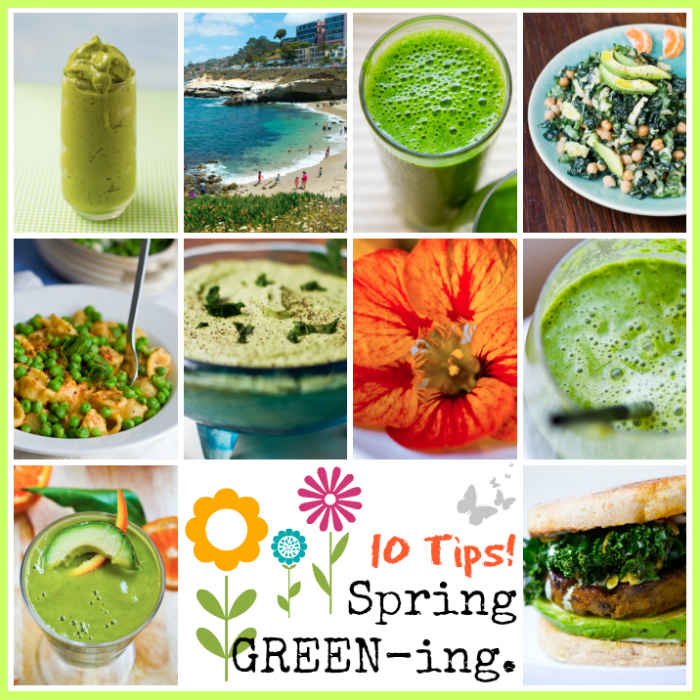 Get my ten tips for some spring greening! Plus enter my spring greening giveaway - one person will win a $75 Whole Foods gift card to help them green their diet!.. What is spring green-ing? To me, green-ing your lifestyle is about starting with YOU. Keeping your body, mind and spirit active, well and well-nourished will allow you to extend your wellness to your community and planet. Before fixing the planet's problems, it is a good idea to take care of yourself first! And the rest will seem easy. A wise man once said, "I'm starting with the man in the mirror. Oh yeah. I'm asking him to change his ways ... if you want to make the world a better place you gotta look at yourself and make a, change! Na na na, na na na, na na na na naa." - wise man, aka Michael Jackson. 1. Blend Green. Green smoothies are an excellent way to add some GREEN nutrition to your diet. This spring, start experimenting with a few green blends! You can green your smoothies by adding: matcha green tea powder, fresh greens like spinach, kale and chard, fresh green fruits and veggies like kiwi, avocado and green grapes. Or try green super foods like spirulina or wheat grass. Green smoothies can easily taste sweet and delicious - even to green-food-phobes. I promise! Check out these recipes: Salute to Green Smoothies. Green Dream Boat Smoothie. Secret Ingredient Matcha Shake. Pre-order my 365 Vegan Smoothies book for a boost of wellness motivation to plop on your doorstep come June! 2. Walk-a-Day Challenge. Here is my challenge to you for spring 2013. Take one walk outside every day. Yup. Even if it is around the block, across the parking lot at work or the long tree-lined path back to your car. Even a few minutes counts. Do it at sunrise, on your lunch break or as the sun is just about to set. Just once a day can green your life. How? Well first off, it will improve your fitness by helping you stay active - get your blood flowing and muscles moving. And second, by breathing the outside air, mingling with the trees, hearing the birds and strolling past a few spring blooms you will become more connected to nature. And in turn be more motivated to live a green life that supports this magical home we call earth. 3. Go Vegan. Sounds simple. But one of the most helpful things you can do for your body, mind, spirit AND the planet is to ditch animal products. I recently watched this video with James Cameron and how he thinks going vegan is one way we can help save the oceans and fish.. Need some recipes? Browse my vegan recipes index or head over to FindingVegan.com for over 22,000 vegan recipes from bloggers all over the web! 5. Green Your Favorite Meals. Add a green spin to your favorite recipes. Try this Green Shamrock Breakfast Sandwich, with kale, green pumpkin seeds and vegan sausage patty for a very lucky spring morning. Or add some green to your Mac 'n Cheez by adding in perky sweet peas. Or green your lasagna: Lasagna Verde. 6. Household Detox. Rummage through your kitchen and bathroom cabinets and read the labels of your cleaning and personal care products. Be sure to note the products that say *NO animal testing* - you will want to buy these brands again! And note the ingredients and warning labels on your products. Too many chemicals for your tastes? And the next time you need a few cleaning products, choose green options OR try out some very basic ingredients like lemon juice, white vinegar, baking soda and essential oils like lavender and citrus to freshen up your home! 7. Farmer's Market Habit. Try to get in the habit of paying a visit to your local farmer's market each week. You will be supporting the 'locavore' movement while enjoying farm fresh produce that you select yourself. Try to buy from organic vendors when possible. Chat it up with the vendors - much can be learned from them! Ask about recipe advice, cooking prep for their produce or just about their farm in general! Get to know the people and places that grow your food. 8. Support Pet Adoption and Animal Sanctuaries. If you are a pet lover, ask your local pet adoption non-profits what you can do to help! Sometimes these companies are in need of volunteers or food donations. Helping animals find loving homes is an act that will make you feel good from the inside out. Other Non-profits like HSUS, Farm Sanctuary, Our Hen House, Teal Cat Project, COK and more would love your support. There are even so many ways money-free you can help, just ask them! Green your spirit. 9. Dip it! Green your snacking hour by whipping up this Lucky Leprechaun Dip. This cashew, white bean, lemon and kale dip is an easy way to feel all spring-y. 10. Start a Recycling Habit. Confession, I was once a horrible recycler! Tossing every bottle right into my kitchen garbage can. But lately I've become much more recycle-savvy. Once you start recycling it becomes addicting! You start *looking* for those recycle bins in restaurants and on the street and it feels good. Pitching in feels good. Finding Balance. To me, "going green" isn't just about the earth - it all starts with YOU. Green your spring by practicing wellness in your own life by eating healthy, taking care of yourself, getting enough fresh air, staying active and keeping stress levels at bay. Only when you find health in your own life can you reach out and bring that same sense of balance and well being to the planet around you. This Giveaway Has Ended. Congrats April @ricedaisy on Twitter! !